One of the most potent symbols of the end of the Cold War was the demolition of the Berlin Wall in late 1989. The state of Germany was formally re-unified in October 1990, and the Bundestag voted to move the seat of Government from Bonn to Berlin by 1998. That decision heralded a decade of negotiations and activities that ended with the opening of a new British embassy in Berlin. Ironically, in 1988, with no visible prospect of any major shift in diplomatic relationships, the British and GDR governments reached an agreement that rationalised aspects of the diplomatic accommodation of each. The UK ceded the vacant Palais Strousberg site, which remained in its theoretical possession, for 99 years (with an option for a further 99 years) to the GDR in exchange for two sites in East Berlin on the same terms – the office site at 32-34 Unter den Linden and the residence site at 6-8 Mittelstrasse. The British government also paid £2.3m. for the buildings on these sites. This agreement was without prejudice to the British government’s position over the status of Berlin and included the right for sites to be taken back if required for development. 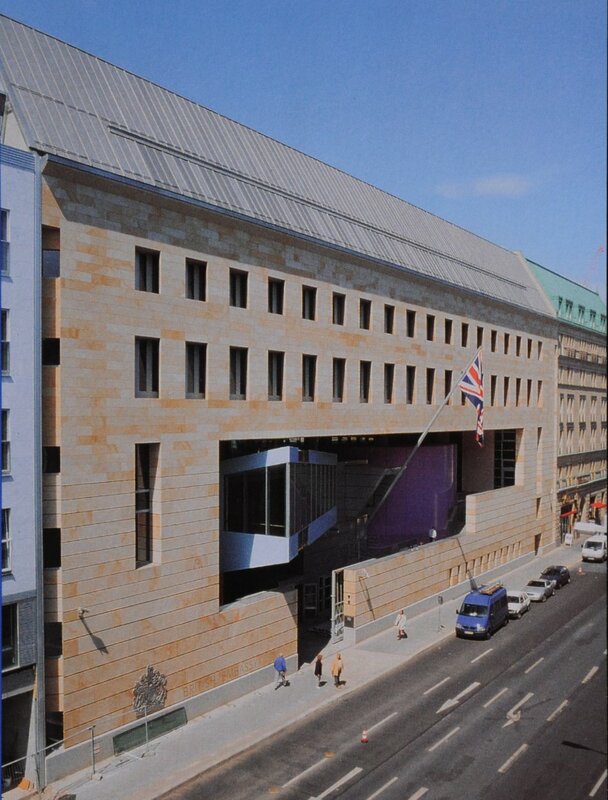 Soon after the 1990 decision that embassies would need to move to Berlin, the FCO began to think in terms of building the new British embassy on the site of the Palais Strousberg at 70 Wilhelmstrasse and the consequent need to unscramble the 1988 exchange. 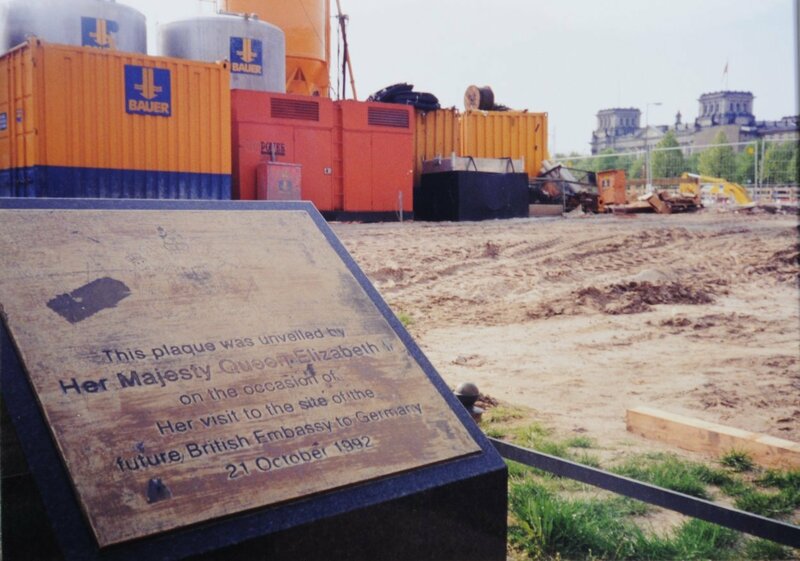 Accordingly, in October 1992, HM The Queen unveiled a plaque recording her visit ‘to the site of the future British Embassy to Germany’. The financial arrangements that had governed British occupation of buildings in West Berlin, the former Occupation Costs Budget (later re-named the Defence Costs Budget), was wound up on 31 December 1991. This meant that property that the British Military Government had occupied free of charge became Federal property, and thenceforth would require the FCO to pay rent. This change prompted a reassessment of the British government’s accommodation requirements and programme in Berlin. The London Block at the Olympic Stadium, the former British Military Government offices, was to be vacated, and returned to the Federal authorities, by the end of December 1992. 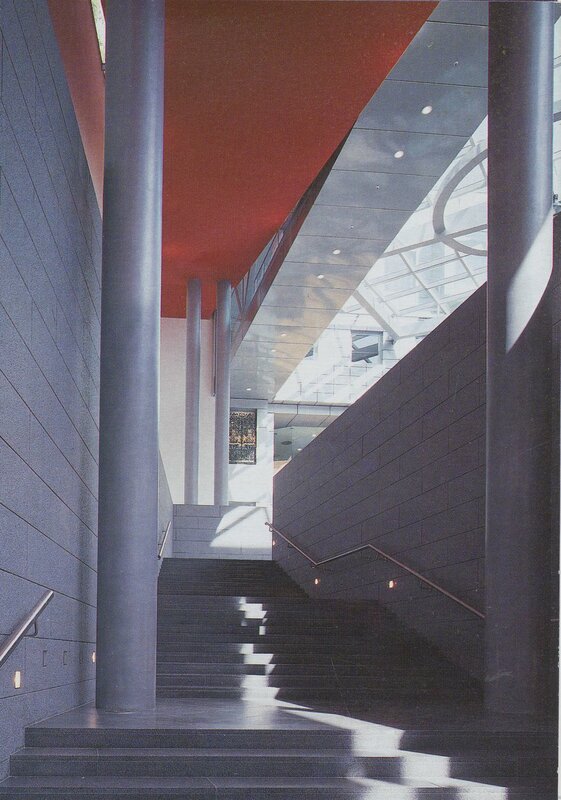 The office block at 32-34 Unter den Linden, the home of the extinct British embassy in East Germany, was therefore refurbished in 1992 to house the British Embassy Berlin Office (BEBO), which comprised staff from both London Block and from the Bonn embassy. Initial planning work on the accommodation requirements to be met on the 70 Wilhelmstrasse site indicated that it was on the small side for the number of staff envisaged. It would also be exceedingly difficult to design a fully satisfactory building of such size on a site surrounded on three sides by party walls, two with the projected Adlon Hotel six storeys high, leaving only the street frontage with daylight. The adjacent site to the south, however, came on the market and the Treasury was persuaded that it should be bought without further ado to enable an altogether better building. 71 Wilhelmstrasse was therefore added to the new embassy site, and its purchase for £6.5m. completed in 1996. By then, it was clear that the date that the seat of government would move from Bonn to Berlin would slip by a year or two beyond 1998. Planning the residential estate for 60 or so UK-based staff proceeded in parallel with planning for offices. The ambassador’s residence could not be fitted on to the 70 Wilhelmstrasse site and, though it might have been squeezed into a building on the enlarged site, there was no compelling case for doing so. A large free-standing house would much better serve as the residence and, conveniently, 10 Hohmannstrasse, the ambassador’s existing pied-a-terre in Berlin rented from the Federal authorities, was fit to become the permanent residence. Likewise, 13 Taubertstrasse , the political adviser’s former residence and also a Federal property, could be retained for the minister in Berlin. Sufficient staff accommodation could be negotiated with the German authorities from the military married quarters that were being given up: the FCO drew up a list of 44 houses, 3 blocks of flats comprising 30 units in all, and a store that it hoped it would be able to occupy when the embassy moved to Berlin. Meanwhile, 27 properties leased by the Ministry of Defence were retained, most of them in Churchill House, to meet immediate residential needs. A land and buildings exchange was negotiated with the German authorities during the early 1990s and took effect on 1 January 1996. Under its terms, the 1988 exchange was undone: 32-34 Unter den Linden and 6-8 Mittelstrasse (and the buildings on them) were re-exchanged for 70 Wilhelmstrasse. And, in addition, the German authorities granted rent-free 99-year leases on 10 Hohmannstrasse, 13 Taubertstrasse, and five houses in Hertastrasse. The Unter den Linden office block was leased back, at a third of the commercial rent, until the new embassy offices were completed on Wilhelmstrasse. Security and other ingoing works were put in hand at Hohmannstrasse to bring it fully up to the standard of a major residence. The eventual residential estate comprised another 35 houses, 13 flats and a store rented from the German authorities through a bulk lease: some of them were sublet until required by the UK-based staff transferring from Bonn. 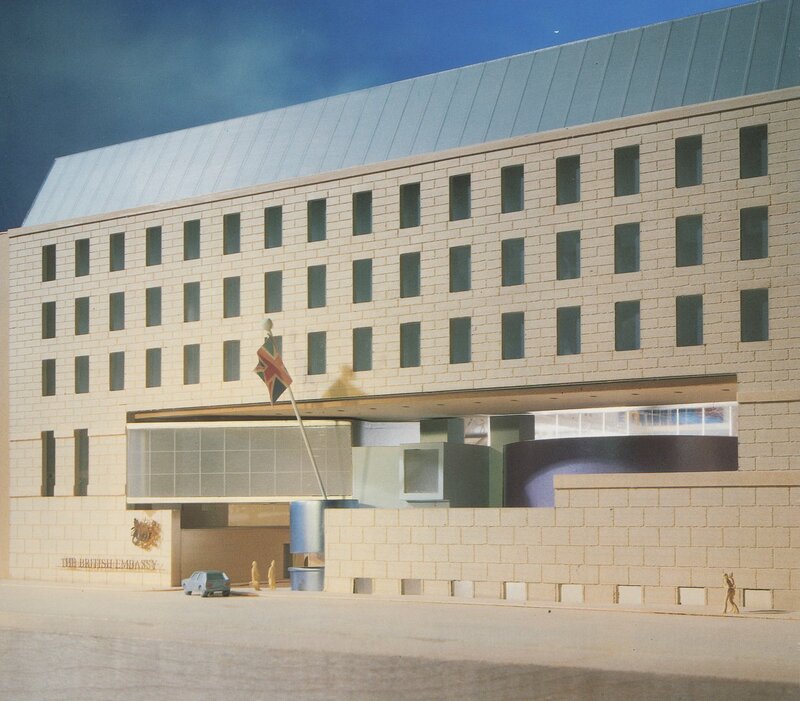 The design and construction of the new embassy offices is described in some detail on pp.440-5 of Room for Diplomacy. 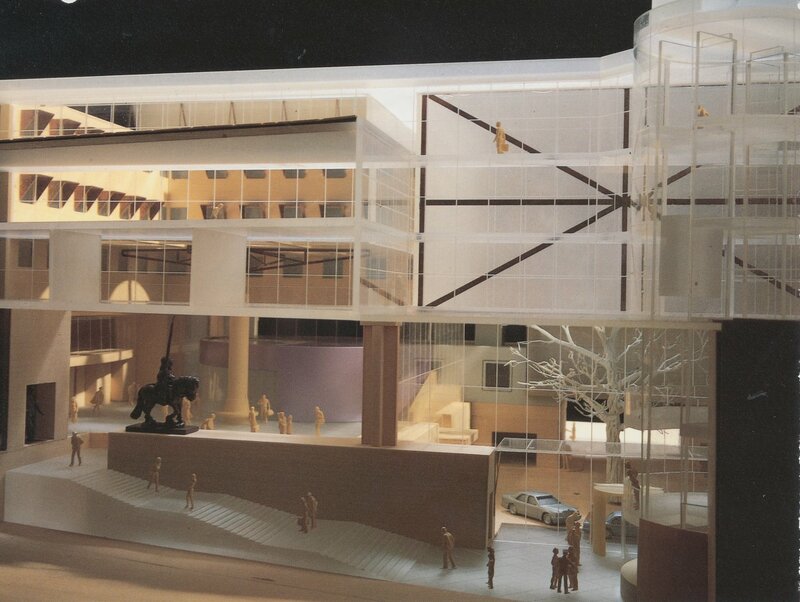 An architectural competition between nine invited practices was held in 1994-5, and won by Michael Wilford and Partners. Wilford’s scheme adhered scrupulously to the strict planning guidelines imposed by the Berlin planning authority and so planning permission was readily forthcoming. Progress, however, was dislocated in early 1996 when the FCO was given no option by the Treasury but to offer up an estate project for treatment under the (much over-hyped and highly dubious) Private Finance Initiative (PFI) mechanism. The FCO’s choice fell on Berlin, on condition that Wilford’s continuing involvement was assured and that his winning design would survive. The preferred consortium, selected in July 1997, was Arteos, comprising Bilfinger and Berger as contractors and equity financiers, Dresdner Bank as loan financiers, and Johnson Controls as facilities managers. Construction started in mid-1998 when the FCO minister of state, Derek Fatchett, performed a ground breaking ceremony by planting a 45-year-old English oak, grown in Hamburg, in the middle of the future open courtyard. The National Audit Office published a lukewarm report of its enquiry into the PFI contract in June 2000, shortly before completion. The Millennium Bug failed to wreak havoc, and Her Majesty The Queen opened the building on 18 July 2000. 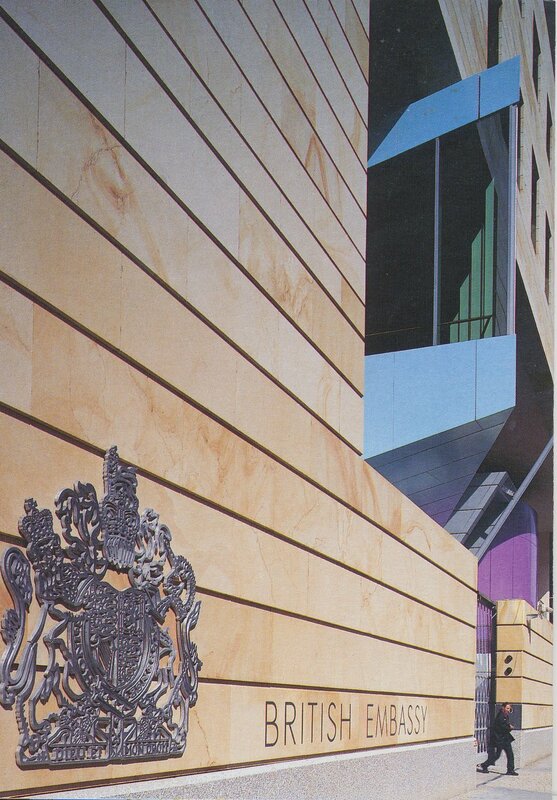 The Plaque unveiled at the both former and future embassy site by Her Majesty The Queen in 1992. Model of Michael Wilford’s competition-winning scheme. 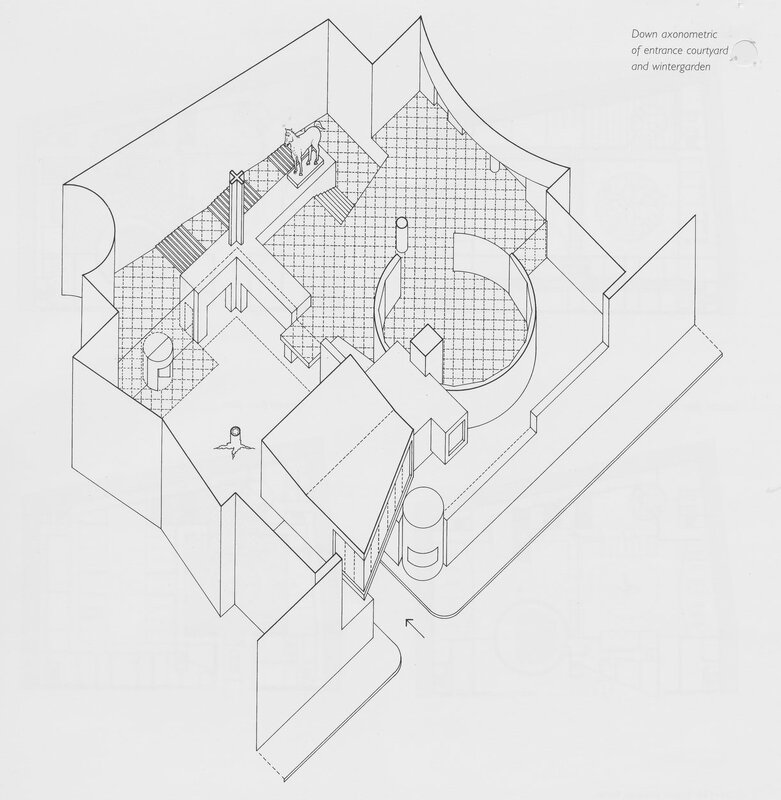 Axonometric drawing of the street entrance, courtyard (with position of oak tree marked by stump), stairway and wintergarden. Completed building, viewed from the south. Grand stairway to the wintergarden. An entrance door grille, rescued from the Palais Strousberg wreckage in 1943, is mounted above the top of the stair.